Fishing in cool weather calls for a good long-sleever, but traditional flannel doesn’t have the technical chops needed for a long day on the water. Starting with a stretchy and durable 6.8-oz 63% nylon/26% polyester/11% spandex fabric, they developed the versatile Long-Sleeved Snap-Dry Shirt as a lightweight, performance-focused layer for the cool and windy conditions of shoulder seasons. 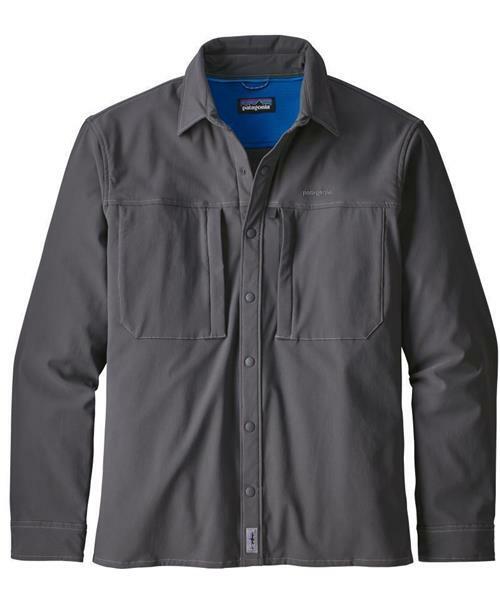 With built-in four-way stretch, the shirt moves easily with your body and provides excellent freedom of motion through the shoulders and arms; the fabric has a DWR (durable water repellent) finish that sloughs off light moisture or spray. The inside of the shoulder yoke is lined with soft, fast-wicking 100% recycled polyester for comfort under pack straps, and the two front fly-box pockets have zip closures with zipper pulls for quick access. Other features include a simple collar, hang loop and a snap-closure front placket and cuffs; a small tool attachment is included on the left chest.